Ratra's Dental offers best sterilization (centres with one of the best sterilization protocols like instrument sterilization systems like autoclaves ( temperature of 121 deg centigrade at 20 lbs pressure ) + chemical sterilization by immersoltm ( glutaldehyde + 1,6 dihydroxy + 2,5 dioxahexane solution ). Air sterilization system by fumispraytm ( ethanol + propanol mixture ). floor disinfection system by hospaltm solution.) & team of oral surgeons for painless oral surgical procedures. Our digital radiography systems decreases the radiographic exposure to minimal levels & rvg system from csn italy helps patient to see the procedure on the screen, our painless anesthesia delivery system like sprays, laser analgesia & microfine needle delivery systems make your dental experience painless & comfortable. 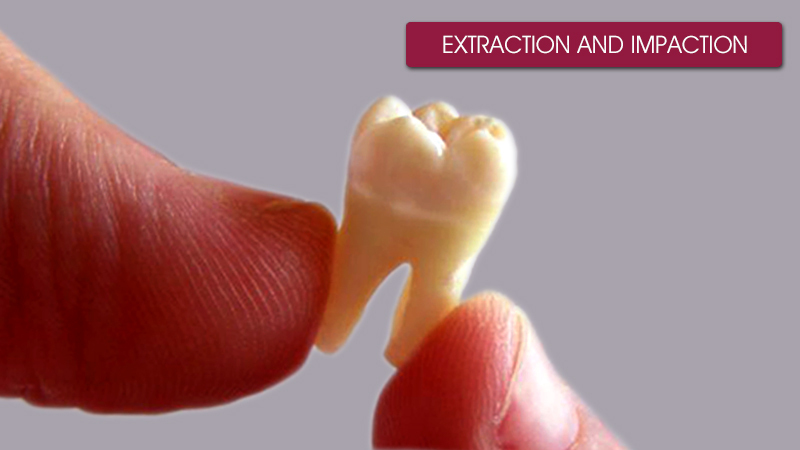 An ideal extraction of tooth is defined as painless removal of tooth or root of tooth from its bony attachments with minimal injuries to surrounding investing structures such that there will be minimum post operative complications. Grossly decayed teeth which cannot be saved by conservative procedures. Teeth that are foci of infection. Teeth with non-vital pulp, where root canal is not possible. In case of severe periodontoclasia in which excessive bony support of the teeth is destroyed. Teeth in line of radiation therapy. Teeth mechanically interfering with placement of restorative appliances. Malposed teeth not amenable to Orthodontic treatment. Teeth associated with cysts and other pathologies. Extensive decay resulting in death of the dental pulp. Extensive decay which makes pulpotomy and pulpectomy impossible. When there is sinus opening through mucoperiosteal membrane. When roentgenogram reveals evidence of periapical infection. When the root is fractured as a result of subsequent infection. When some precautions have to be taken. Keep the sponge held firmly between your jaw and over the operative site for full half an hour. Do not use mouthwash for six hours after oral surgery; vigorous use of mouthwash may stimulate bleeding. In case of mild bleeding place cold water in the mouth. In case of severe bleeding place a cotton pellet soaked in cold water over the bleeding and cover it with gauze biting firmly and call your dentist. In case of swelling and followed by discoloration, patient need not worry because itÂ´s an absolutely normal event. Pain in case or afterwards of surgical procedure is a normal phenomenon. Post operative pain can be controlled by taking medicine. If severe pain develops accompanied by bad taste then return to your dentist for this treatment. To control swelling which develops post operatively apply ice pack or towels wrung out of ice water. Day after operation, apply heat to your face. Rigid cleanliness is necessary of the remaining teeth. Mouth wash in a glass of lukewarm water. This promotes healing. Avoid meat and food difficult to masticate for a few days. Eat plenty of fruits and drink eight to ten glasses of water, fruit juice and other fluids daily. After oral surgery there is diminished in take of vitamin therapy i.e. Vitamin C & B complex. Drugs especially analgesics decrease the level of vitamin C in the body. Ascorbic acid is essential for the maintenance of normal cellular material of connective tissues, bone, teeth and blood vessels. If vitamin C level falls, healing is retarded, capillary fragility is increased.